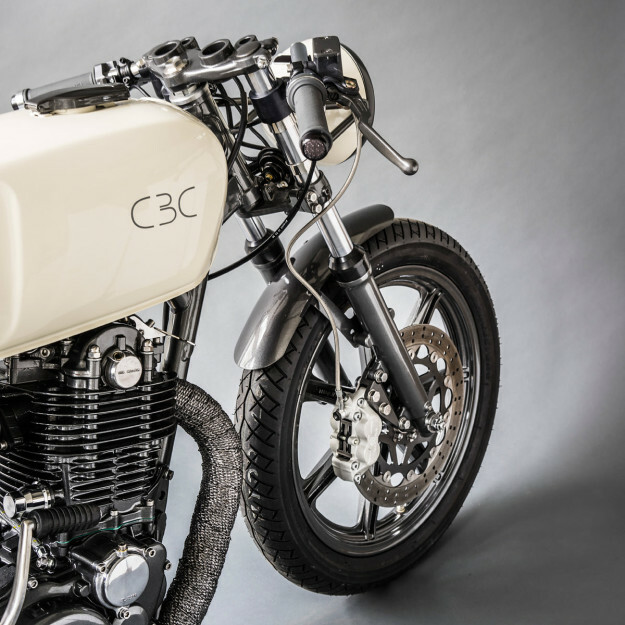 Half a century ago, a café racer was a bike stripped to the essentials. Tuned for maximum performance over the short haul, it was usually a secondhand bike that didn’t break the bank—and was tweaked on a budget. 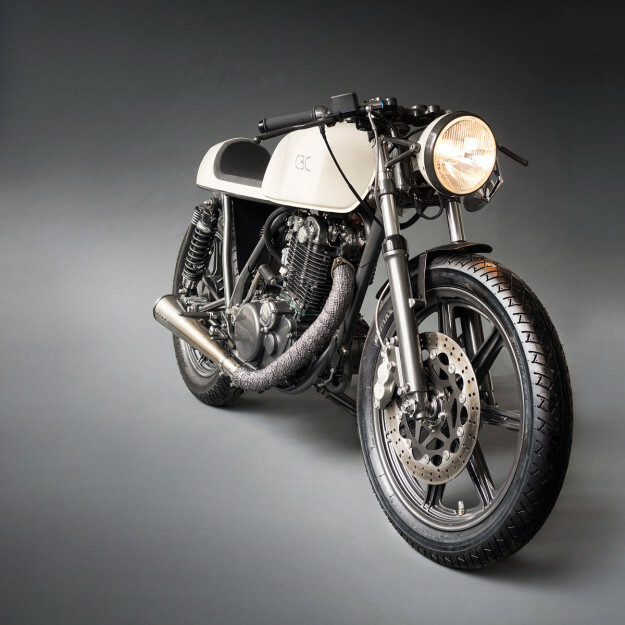 These days, the true modern café racer is probably a ‘streetfighter,’ a battered GSX-R or Ninja stripped of its bodywork. 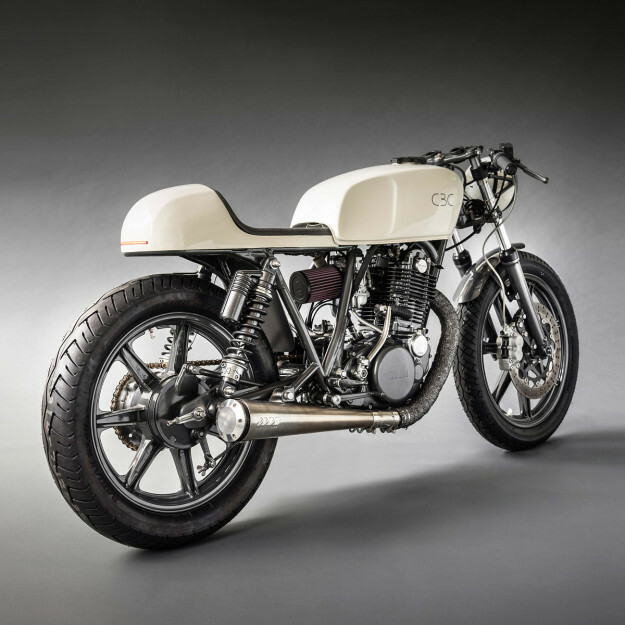 But we prefer the charm of bikes like this German-built Yamaha SR500—a thoroughly modern custom with a nod to the classic British style of fifty years ago. 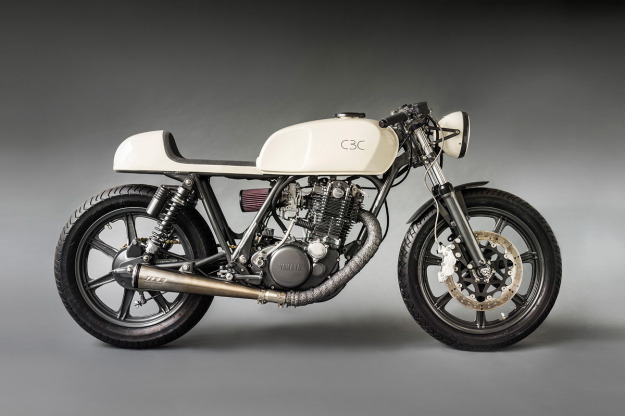 It’s a 1979 SR500 belonging to Hannover-based Patrick Frey, an industrial designer with petrol running through his veins. 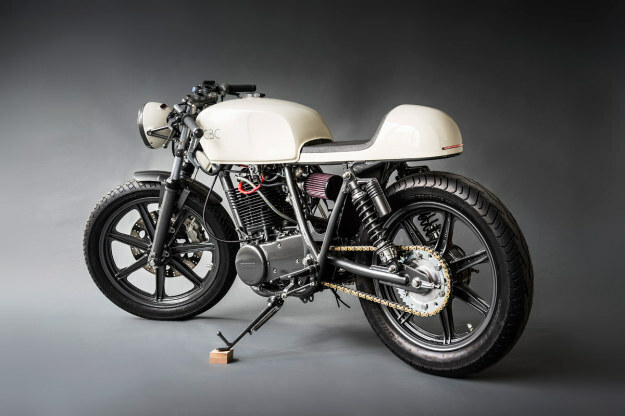 He’s imbued his Yamaha with a clean, understated look—and boosted the dynamics without compromising usability. You could say it’s a textbook ‘new wave ‘ custom. Yamaha’s bulletproof single gets added pep from a Mikuni TM36 flatslide carb and a K&N air filter. Gases exit via a free-flowing SuperTrapp megaphone exhaust with a satin finish. To get the right stance, he’s lowered the forks four centimeters and fitted shocks from a Kawasaki Zephyr 550. The tires are sporty Bridgestone Battlax BT45s. The braking system is upgraded too, with Brembo P4 components and an EBC 320mm floating disc. Brembo levers are slotted onto Telefix clip-ons, and the rearsets are from LSL. Patrick has installed a new loom to keep the wiring to a minimum, and hidden a gel battery and most of the electrics under the custom seat unit. 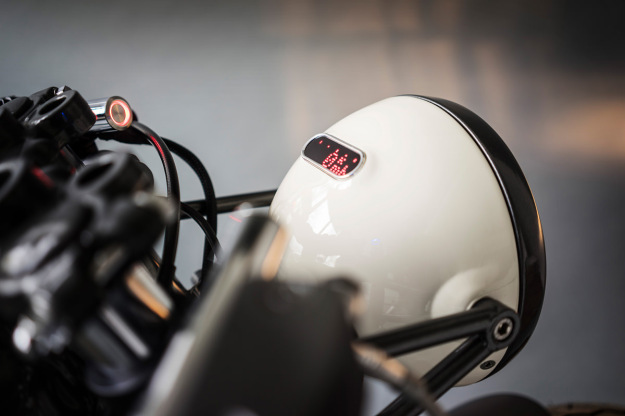 Tiny indicators are built into the bar ends, and the brake light is a slim LED strip at the back. 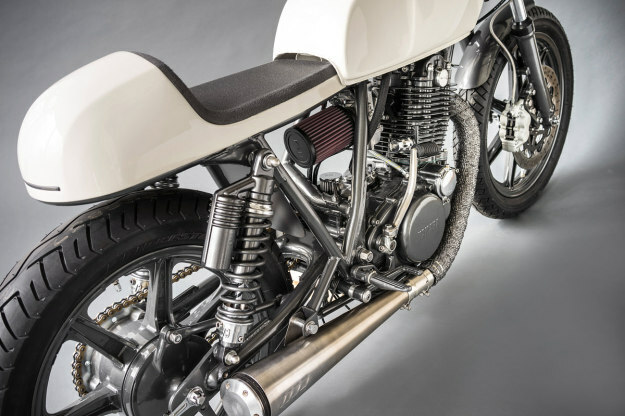 The lower half of the SR500—all the engine and mechanical parts—is coated in graphite metallic powder. “There are so many elements on a bike and so many different forms, but having one color settles it down,” says Patrick. Up top is a simple, creamy gloss white. It’s stark but effective. If you’re hankering after a cost-effective and stylish bike that’ll keep running until the gas supplies dry up, consider this as the blueprint.